Tell tails are fine pieces of wool (or other light material) attached to the luff of the sail to help you tell if the sail is trimmed properly when sailing across the wind (beam reach) or upwind (close reach, close hauled). Where to place ‘tell tails’? 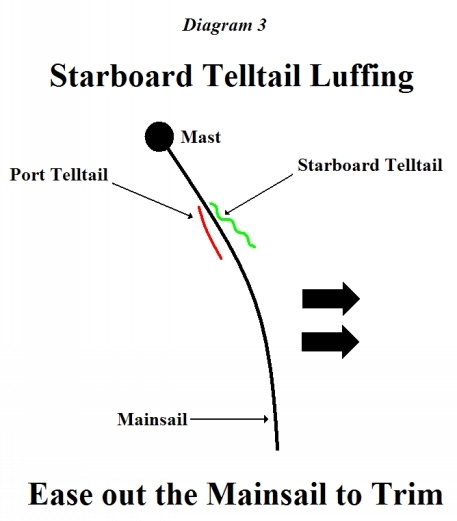 There is no strict rule as to placement of ‘tell tails’ other than they are placed along the luff of the sail. Most sailors, on the main sail, will set their ‘tell tails’ about 6 inches in from the luff at the one third, one half and two third points of the sail. You can buy ‘tell tails’ or you can make your own using sail tape and machine washable wool. Make your tell tails between 6 inches (small boats) to 10 inches (larger boats) long. Use red and green strands placing the red on the port side of the sail and the green on the starboard side. The reason for this is that it is often difficult to tell which ‘tell tail’ you are looking at, especially when the sun is backing the sail. Colour coding your ‘tell tails’, will help you distinguish which side of the sail you are looking at. Why do we want or need ‘tell tails’? 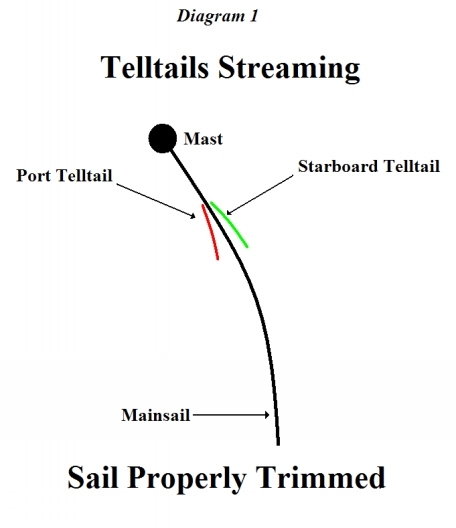 Tell tails are a sailor’s best friend for determining how efficient the sails are working from top to bottom. If you upper inside tell tail is streaming but the lower inside tell tail is luffing, this tells you that the lower part of the sail is not at it’s optimal shape and the sheet needs to be tensioned until the lower tell tail starts streaming. 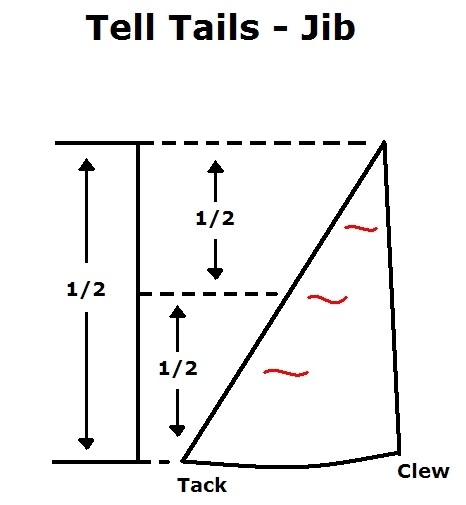 The diagrams below will help you understand how ‘tell tails’ work. Ideally you want the ‘tell tails’ flowing straight back (streaming) with the sail. (see diagram 1) This tells you that the sail is properly trimmed for your present point of sail. If the mainsail has been eased out too far, the ‘tell tail’ on the inside of the sail, will start to flip up and down. 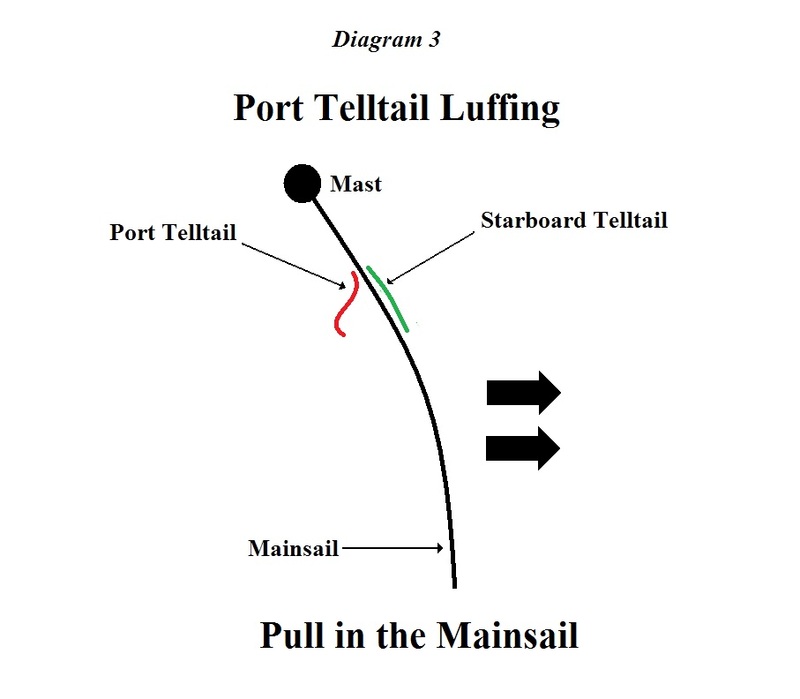 (see diagram 2) This tells you that the mainsail needs to be pulled in until both ‘tell tails’ start to stream. Remember, when you sail close to the wind, (close hauled), the sails need to be pulled in tight to the boat. The mainsail should be hoisted as high as it will go. The Cunningham, which controls the tension on the front corner (tack) of the sail, should be fully tightened. The outhaul, which adjusts the tension of the sail along the boom, should also be tightened. The idea is to create a flat sail. The windward Tell Tail will often luff on a Close Haul. We get power from the leeward side of the sail so on a Close Haul, if you are unable to get the windward and the leeward Tell Tails streaming, at least get the leeward Tell Tail streaming. When you start to sail down wind you do the opposite. You want a sail that is out and more rounded. This requires easing tension on the Cunningham and the outhaul and possibly easing the mainsail halyard a few inches. Note – once the aerodynamics of the sail shift from acting like and airfoil to being pushed by the wind, the Tell Tails will no longer be of assistance for sail trimming. Watching your ‘tell tails’ will let you know if you are doing the right thing.